Still room in the schedule for a few more flights. It's around the same as last year. In other news there are now three scheduled cargo flights (1 x 747, 2 x MD11). Just out of curiosity but who are operating these cargo flights and are they on a scheduled basis or adhoc? Scheduled as stated, each is weekly. The 747 is Air Atlanta Icelandic, the MD11's are Western Global on behalf of the contractor. Is one of the weekly cargo flights a ‘fruit and flowers’ flight from Nairobi ? I seem to recall reading something about this when I visited Doncaster last year. Did you know that less than 10% of people travel out and back for business in one day? Depends what your definition of a "viable business route" is. At the moment if you want to travel from the Doncaster region to AMS you have to go to EMA or MAN. Who wants to do a day trip where you have to add at least an hours commute to each end before you even start your flying? Much better to have a days work, travel in the afternoon, meet your client for an evening meal, have a good nights sleep in a hotel and then have your business meeting the next day don't you think? The lack of a return flight consistently annoys me. From Ireland I fly back to Manchester and train it back to Doncaster. Very inefficient. When I was doing the netherlands I was never able to find a way to avoid a night stop - although this was more cost effective then flying a daily return from Humberside. Even if you are staying overnight - you want to chose yourself whether you have a full day there on day of arrival / departure, or whether you travel after a full day of work! I respect the stats given, however the broader point being made was BE’s indifferent offering at DSA compared with its other bases. They are playing with routes and claiming destination flags rather than providing flexible supply. Without flexible supply there will be limited demand. It goes further than BE though at DSA, I understand the protection of incumbents, and the risks of inviting new airlines but all successful airports have multiple carriers offering the same routes, and again it is the flexible supply that generates the demand - just like any other consumer product, people will drive to a supermarket for the larger choice 24 hours a day rather than walk to the corner shop with its limited choice and opening hours. And competing supermarkets will open next to each other. The larger supply makes the town more attractive, and local populations increase. All of Wizz’s success has been due to its supply of product, let’s just hope Peel aren’t suppressing any Wizz uk ambitions at DSA to protect BE. I doubt they would. The frequency on DUB and AMS, for example is much lower than the competition, which is a shame considering BE works with both KL and EI. Without checking, I think ALC is the only destination served by more than one airline. Even then, one-way prices are usually at least 70 quid and often over 100, and departure times from DSA are often very early in the morning. Add Palma, Malaga and Faro to that. Interesting that the Flybe schedule for this summer ends a month earlier at DSA than any other airport. This is the front of the Yorkshire Post. 250m tonnes of freight a year. 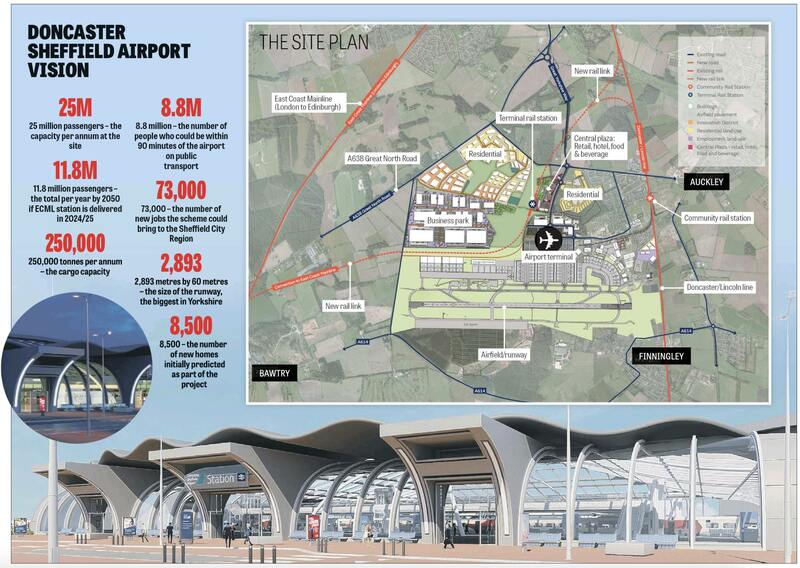 A very grandiose masterplan BUT the comment "over to you Mr Grayling" perhaps shows the poverty of knowledge when it comes to aviation decisions. Other than possibly diverting the East Coast line to DSA I'm unsure what other inflence he has. It's a bit like HAL suggesting every regional airport in the UK from Alderney to Wick will be connected to Heathrow once rw3 arrives ! It's not them fronting up the money or making the route decisions. I think that's a tad ambitious given EMA, the second busiest freight hub in the UK, is doing around 320,000 tonnes. Isn't the East Coast Main Line already near capacity? As a supporter of the airport this is to me, just another spin of the Peel PR machine which has been in force since day one. Who stands to reap the rewards the most - Peel. As a consequence of the land they will sell/lease. Where will the £280M come from - the hope is that funding will come from a mixture of private and public money procured from both regional and national Government. Wildly unsubstantiated figures from Peel (who were well out on the last masterplan). Before any apologists state other factors got in the way, they can also do so in the future. The figures quoted are an inflation of the very best outcome and not reality in my opinion. Thought I was on the DTV thread there for a mo. !! Very ambitious plans indeed but I have to say it looks good. If DSA could secure an ambitious airline for the long term growth potential and with the possibility of a large fleet based at the airport covering a wide network these plans for development could well be seen in the future, but if only, otherwise it's just what it is an idea! Complete pie in the sky. Just look at the size of the GA apron to stat with. No doubt phase 1 will be selling land off for house building. Very impressive. Has the potential to turn not just the immediate area, but most of West and East Yorkshire and Lincolnshire into a genuine economic powerhouse. Doncaster and the wider South Yorkshire area have been very good at attracting infrastructure investment in recent years, I would not be at all surprised if the ECML spur was quickly funded and delivered, especially as the government will want to be seen to be making a success of the newly devolved Sheffield City Region. Add in the forthcoming upgrades to the road network (A1(M) upgrade, Trans Pennine Tunnel and new M1>M18/M180 link) and this could be huge. My only criticism is that there is no direct rail link to Sheffield and no mention of potential connectivity to HS3, if it ever gets green lit.